Minster Gates bookshop is situated close by the South door of York Minster. This small street has enjoyed a long association with books. Formerly known as Bookland Lane, the street was later known as Bookbinder's Alley. .The inventory for the stock of John Foster who operated as a bookseller from Minster Gates 1580-1607 still survives. 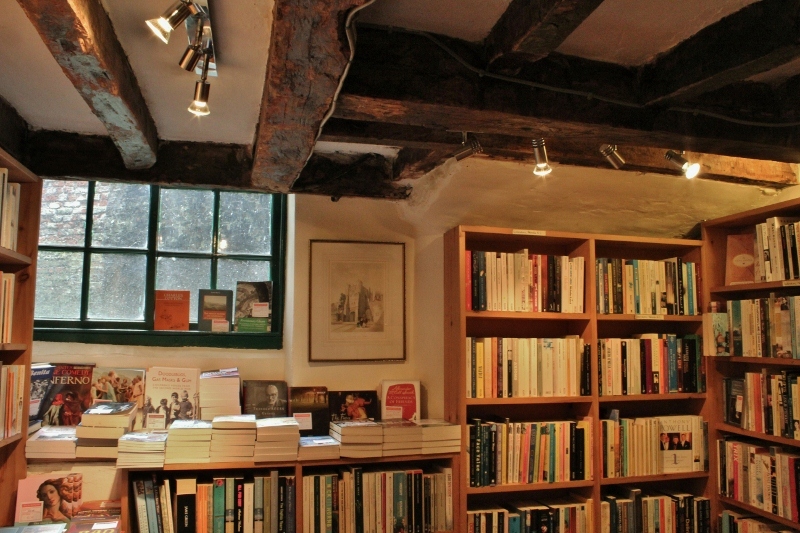 The current bookshop is spread over 3 floors and stocks a mix of new and second-hand books, it is well worth a visit. I love secondhand books, rarely buy a book for myself new. Must have missed this place on my recent trip around the city. It's good to see a bookstore like that surviving! In this digital age of e-books, etc., wonderful to see a store like this look so inviting. Thank you for the peek inside this bookstore...because I never was able to get back there for a good long book browse! I do have a photo of the sign out in the lane with York Minster in the background. One day I hope to cross the pond again and maybe spend half a day inside that shop...adoring books as I do, especially used ones, I know it would be a wonderful place to spend some time.